The Model 6550ST provides a huge 550 bushel capacity, and the flexibility to use it all! The Metering Drive & Transmission ensures accurate & consistent metering rates. The Model 6550ST provides a number of Tire Options which ensure minimial compaction, even when this behemoth is full. Working Lights are located in key locations to enhance productivity and safety during night time operation. The Model 6550ST Integral Tank System provides industry leading efficiency of the tank capacity. Cab Rate Adjust gives you easy on-the-go control of product rates. 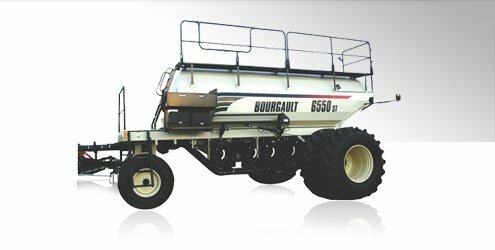 Bourgault is the first in the industry to provide the Product Lift System for operator safey and convenience. The EZ Air Seeder Hitch allows you to be "close enough" when pinning the Air Seeder to the seeding implement. The convenient Power Hydraulic Calibration System provides a quick and simple means to achieve an accurate rate setting. The standard Model 591 Air Seeder Monitor gives you standard monitoring features for up to four compartments. Optical Blockage Sensors are available as single run or full run packages. The Model 6550ST is equipped with the 10" Deluxe Load/Unload Auger that will greatly reduce your fill times. Tank Mounted Camera System - Bourgault offers a leading stand-alone monitoring system that allows you to watch what is happening in each compartment and behind the air seeder.